Remember that scene in the Michael Keaton movie Multiplicity when I believe Michael Keaton clone 2 tries to explain to Michael Keaton clone 1 what is wrong with the degenerate Michael Keaton clone 4? I think the exact line is "You know how when you make a copy of a copy, it's not as sharp as... well... the original." That's pretty much how I would explain DIVERGENT. I hesitate to even compare The Hunger Games to this wildly discordant, often corny film that only flirts with good elements without maintaining them because I feel it belittles the former. But here's the thing: DIVERGENT, despite multiple claims otherwise, tries to capture the format of The Hunger Games but completely phones in almost each element. Sure, it may have a teenage girl (Shailene Woodley) who's forced to separate from her family, who's on the verge of becoming the face of a major apocalyptic rebellion, a smoldering placeholder love interest (Theo James) and be loaded with girl power themes, but it doesn't have the layers or complexities you'd expect. Rather, it just goes through the motions without offering much else. Woodley, who has proven in the past that she can add a level of maturity to roles she's played, is ill-suited as Beatrice--a bold, sometimes sharp-tongued, inquisitive teen with an empathy streak. Born into the community of Abnegation, she is endowed with the pitied virtue of selflessness in a world that values and rewards valor. 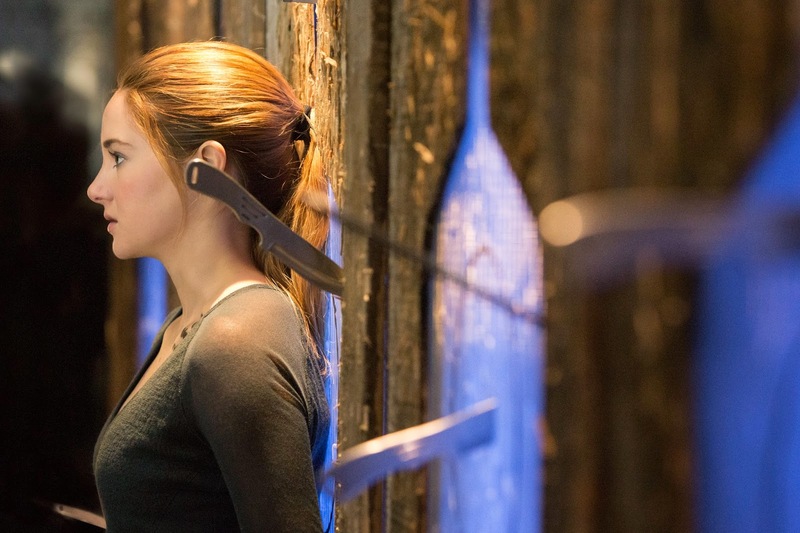 When she must embark on the nation's rite of passage, a blood test to determine which faction she belongs to, she learns she's Divergent and has characteristics of all five factions (Abnegation, Erudite, Dauntless, Amity and Candor. Which means she's a threat to the natural order unless she takes it upon herself to choose another path. So she decides to disguise herself as a citizen of Dauntless, the dangerous community of tattooed misfits that are groomed to be militant soldiers. While there, Beatrice discovers a much larger plan that will destroy each community. Of course, it's up to her to put an end to that. Her and her gorgeous new beau Four (James) that is, who despite the fact that he is her commanding officer who's supposed to be intimidating her, publicly offers her special interest and even gives her pointers on how to trick the system. I mean, in front of everyone yet no one notices this. But even with its obvious ploy to attract the more impressionable young audiences (contrary to The Hunger Games's wider fan base), DIVERGENT comes off silly and unnatural, completely underestimating the intelligence of YA fans. Little slips like not fully explaining the "war" that led to these factions an important piece of information that would have helped with story development, and why it is such a big turning point when the hoity-toity nation head honcho Jeanine (Kate Winslet, in apparently a paycheck performance) learns of Beatrice's true test results when Jeanine tells Tris earlier in the film that she knew them and didn't seem to care. Like, what? Even Woodley's casting seems forced, like they're trying to make her into the kind of actress that she just isn't--a Jennifer Lawrence version 2.0. They even have the same haircut now! Single white female anyone? Woodley's thrives in playing far more subtle characters. Beatrice, who changes her name to "Tris" in Dauntless, has to become this tough action hero role model for her peers and I'm not even sure she is 100% confident in this role. Some of the lines come off clunky and completely ineffective. She may be leaping from rooftops, wearing a skin tight leather jumpsuit in order to fit into her new gang, and getting in the ring with her new hoodlum cohorts (which include Zoë Kravitz and Miles Teller), but she does not own it. Granted, it's supposed to be a gradual progression, which should account for Beatrice's apprehension in the beginning, but that never really goes away. As a result, we never truly believe her. Even her romantic scenes with Four (did I mention how hot he is?) seem more on a brother-sister level. Which may be partially due to their particular chemistry, but also due to how heavy-footed the story is. A lot of the elements seem tacked onto the story per obligation and are not seamless. 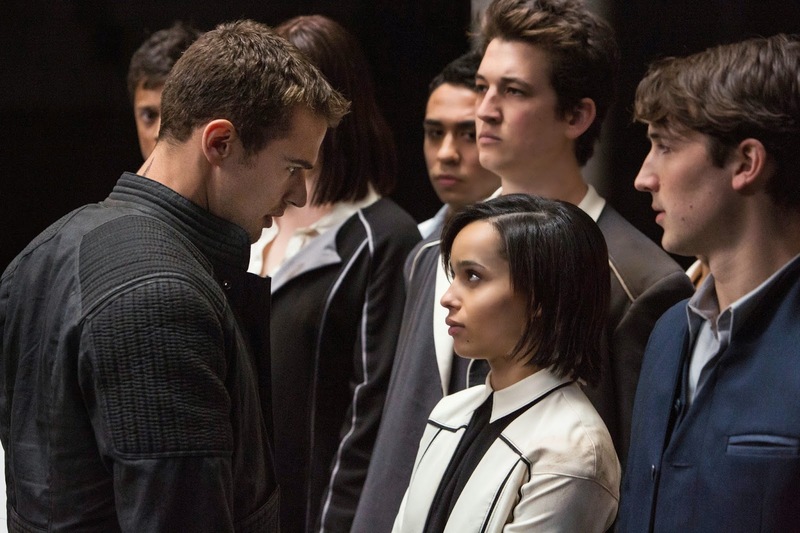 DIVERGENT isn't all awkward and contrived. It's also inconsistent. Its bad scenes are often countered with genuinely well executed sequences that we don't get to see enough of. 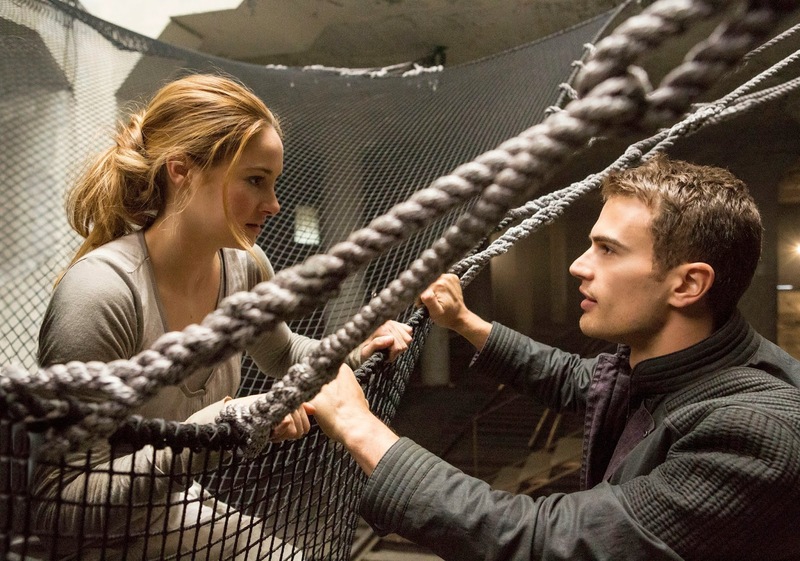 Like each time Tris must battle her fears through needle-induced hallucinations, while at the same time fooling those in the higher order by pretending that she doesn't have special capabilities. Not only is the photography well done, but you can tell this is where Woodley excels and is most comfortable--these far more confined scenes in which she must become her own hero. Truthfully, the movie is bigger than Woodley, so these more enclosed scenes are where she shines. 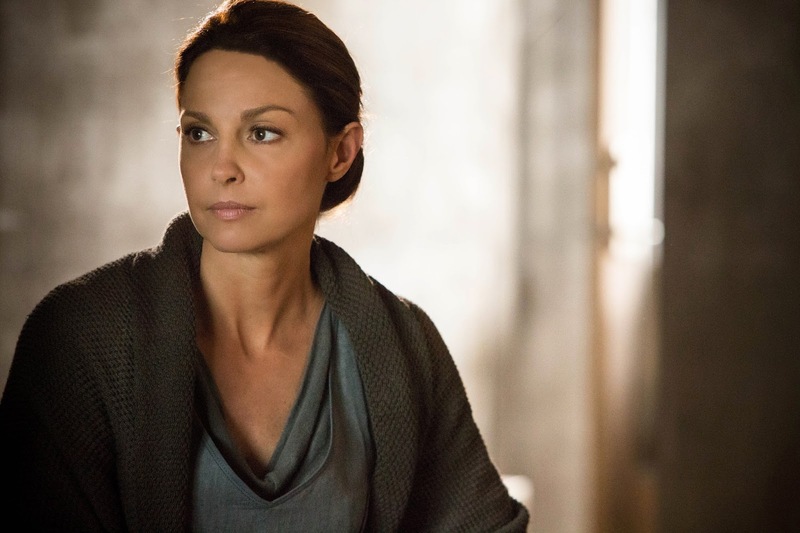 And thank Goodness for Ashley Judd and Tony Goldwyn, who are in the film all of 20 minutes total but make the most of their screen time as Beatrice's devastated parents who end up coming in at the 11th hour right when the rebellion heats up. Judd is especially affective and, despite her character's utter solemnity over the conditioning of the nation, she portrays bravery far more organically than anyone else in the film--including Woodley. She adds a layer of desperation and meaningfulness that is missing everywhere else in the film. Director Neil Burger, who's clearly still recovering from the disaster that was Limitless, tries to at least bolster Vanessa Taylor and Evan Daugherty's screenplay adapted from the Veronica Roth popular novel trilogy. But sadly this massive vehicle falls down right on top of them. Hopefully the next installment gets back on track. We can't have a whole bunch of these degenerates populating the big screen. Daaaang. Great review! Well, it sounds like I'll wait for this one on VOD. Good review Candice. If there's anything saving this movie, it's James and Woodley's chemistry together. They actually do seem like they're attracted to one another in a way that isn't crazy of full of all sorts of hormones. Everything else though, is pretty unspectacular. Thank goodness I skipped this film, it's sounds like it's exactly as generic and phoned in as I expected!